Most of us at one time or another allowed ourselves to dream of what it would be like to be our own boss. This natural day dream might have occurred when we did really well and thought of how nice it would be to be the owner of our own success or it could be on bad days when we really cannot stand the idea of going back to work tomorrow. Some entrepreneurs take a hobby or a personal passion and try to turn it into a job while others simply turn their job into their business. Regardless, most realize that owning your own business is not what thought it would be. Martin Zwilling in his post on Business Insider does a good job of describing the life of a successful entrepreneur (http://articles.businessinsider.com/2011-01-17/strategy/30098243_1_successful-entrepreneurs-real-commitment-work ). He identifies seven characteristics that increase the chance of entrepreneurial success. One of the biggest complaints entrepreneurs make is that they left regular employment to have more freedom and flexibility and have found owning a business to be more demanding than working for someone else. Nevertheless, it is important to note, that most organizations would gain from having more employees that possessed the aptitudes or behaviors that make an entrepreneur successful. This is not to say that organizations should create as many workaholics as possible, but that there are other characteristics that can have a sustainable and positive impact on your organization. A few of the common characteristics praised in entrepreneurs that benefit an established organization include a passion for the organization and its products and services, strong commitment to success, acceptance of risk, and desire to build a strong team. 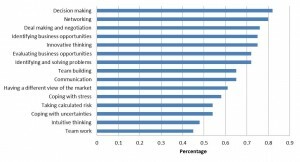 A 2011 survey by HCS asked 250 leaders in private organizations what are the most important entrepreneurial competencies they would like to see present in their organizations. The results appear in Figure 1. 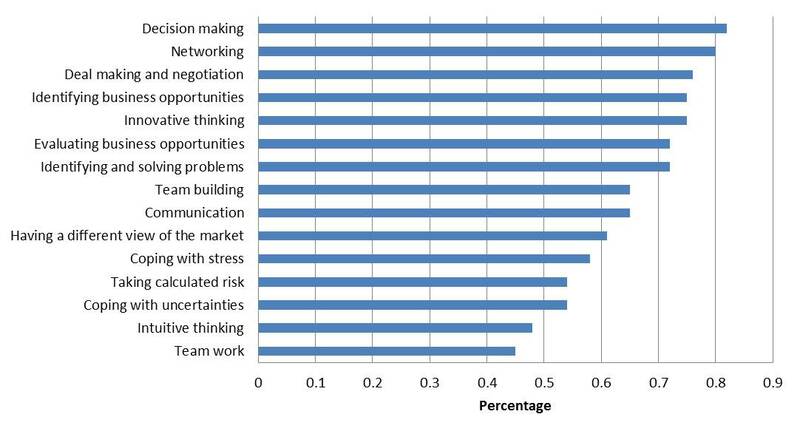 Not surprising, those most identified include decision-making, networking, and deal making. In other words, organizations would like to hire employees that can make effective decisions, possess strong relationships that will benefit the business, and can close business when the time comes. Innovative thinking, solving problems, and identifying/evaluating opportunities fall in the next cluster. Creativity is a rare commodity in the marketplace and even rarer when you consider how often it is combined with the ability to create and market products. The remaining competencies are a little more common, but provide for a nice combination when present in the same individual or organization. keeping up what is going on in the market. This entry was posted in Uncategorized and tagged entrepreneural competencies, ownership. Bookmark the permalink.